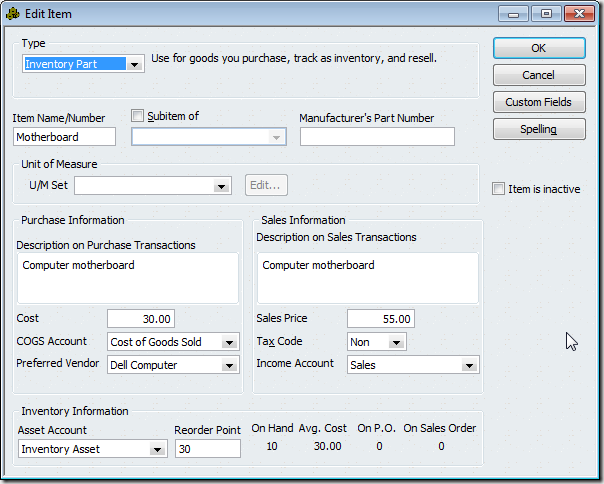 QuickBooks Premier and Enterprise provides us with 11 different item types, of which 5 can be used as component items in an inventory assembly. Which should you use, and why? Each of the item types have their own characteristics and uses. 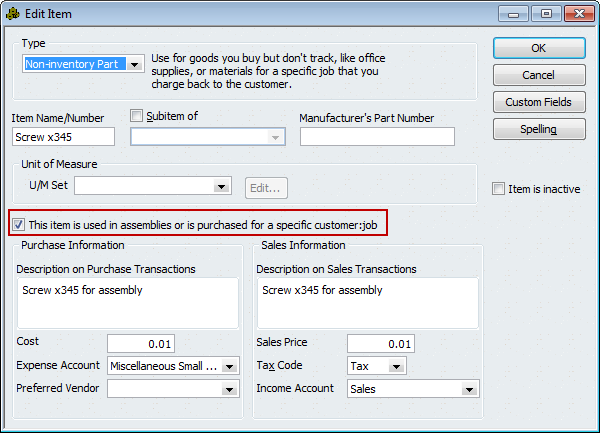 If you are a manufacturer, odds are you are going to use an Inventory Assembly item to manage your inventory. You will create a Bill of Materials (or “BOM”), which lets you issue a build transaction. The basics of working with a BOM is discussed in my Manufacturing Bill of Materials article. Here is a sample inventory assembly, a “computer base system” that is composed of several components: A “Case”, a “Motherboard” and 10 screws. Let’s talk about the kinds of “items” that we can add to the BOM. This is the most obvious, and basic kind of item you can add. An Inventory Part is an item that you are buying and stocking, where you want to track the quantity you have on hand. These will be parts that have significant value, that you want to track to make sure that you have enough on hand. Items that may stay around for awhile on the shelf, and so should be “capitalized” when you buy them instead of “expensed”. When you purchase these items, the cost of the item is saved in an inventory asset account, which should exist on your balance sheet. The cost doesn’t go to your profit/loss statement immediately as an expense. 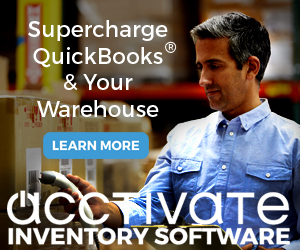 Using Inventory Part items provides you with some advantages and some disadvantages in QuickBooks. 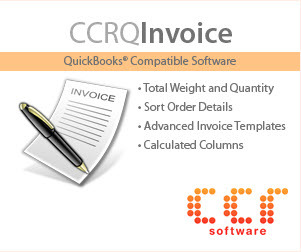 An advantage – you can track how many you have on hand, and see them in a variety of QuickBooks management reports. A disadvantage – you must have a positive inventory balance of the inventory part components before you can build an inventory assembly – if you don’t have the component parts, you can’t build the assembly. 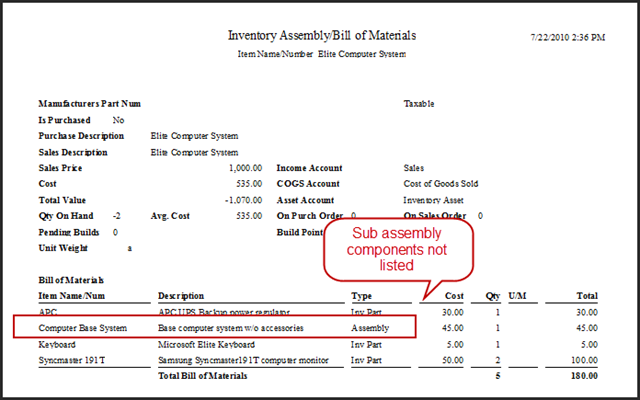 When you build the assembly, the value of the Inventory Part items will be moved out of the component inventory asset account and moved into the assembly inventory asset account. 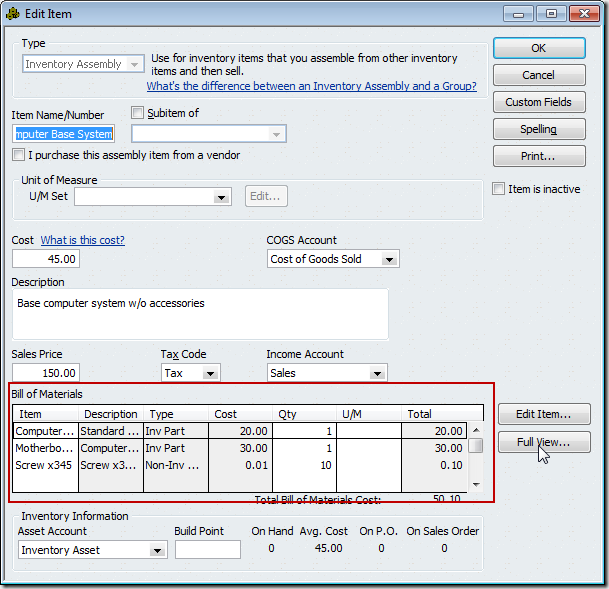 For a better understanding of inventory costs, read my articles on Understanding QuickBooks Inventory Cost and Understanding QuickBooks Total Bill of Materials Cost. An Inventory Assembly component item is treated the same as an Inventory Part – you must have an adequate supply of the assembly component to be able to build the higher level assembly. Costs are handled the same way here as they are with the Inventory Part components. Using “sub assemblies” this way provides you with the ability to break down your complicated products into simpler, more manageable groupings. I think it is best if you can keep a list of components down to one printed page (or less), so that you can easily see what is included in the assembly. 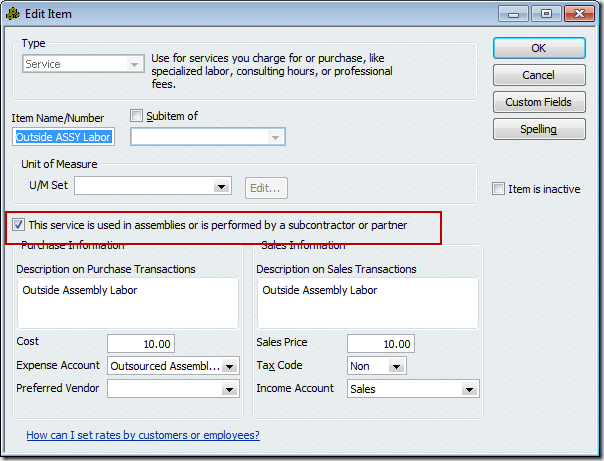 In addition, QuickBooks Premier limits you to 100 component items in a Bill of Material, so for complicated assemblies you must use sub assemblies (or, move to Enterprise, which has a limit of 500 component items). Using sub assemblies does create more work in some cases, since QuickBooks won’t print or process a “multiple level” assembly item all at once. I’ll discuss this a bit more later in this article. Sometimes there are parts that you use in your building process that don’t represent a large portion of the value of your inventory, or of the assembly itself. These are parts that you don’t worry about tracking quantity – you buy them in bulk and just order more when you see that the “bin” is getting low. They could be things like small washers, screws, and so forth. These are often good candidates to be Non-Inventory Parts. When you buy a non-inventory part it is “expensed” right away, rather than capitalized. It is important that you set these items up in the correct way. 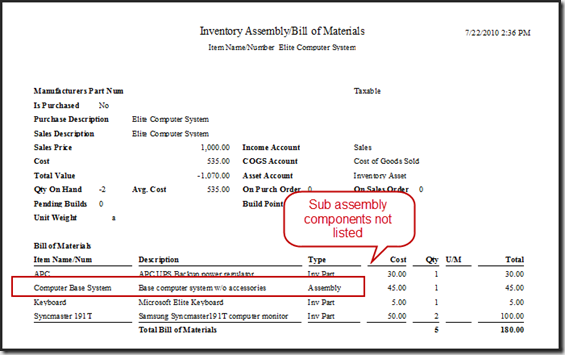 Make sure that you check the box titled “This item is used in assemblies…”. When you check this box you make this a “two-sided” item, with a separate expense and sales account. 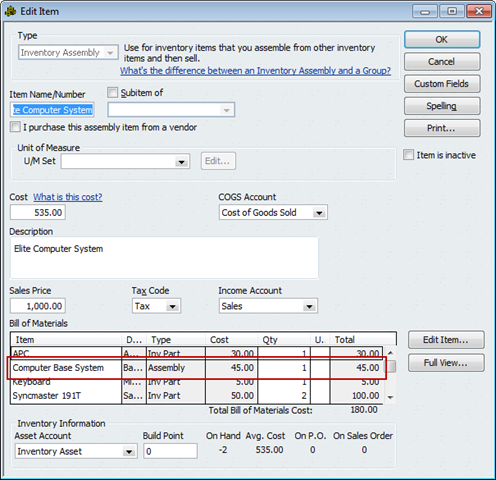 When you build an assembly the “cost” of the Non-inventory Part item is removed from the expense account and included in the inventory asset account of the assembly. I use these kinds of parts when the cost of an individual item is very small, so that I don’t worry about tracking the balance on hand of the parts. If you lose some during processing (drop them on the floor, etc.) the loss has already been expensed. However, if the items are hard to come by and take a long time to acquire, you may still consider using them as an Inventory Part item. You can add both Service and Other Charge items. I’ll have to admit that at this point, I don’t see a large difference between the two, other than being able to specify a unit of measure for Service items but not for Other Charge items. If there is a reason to use one or the other, please let me know! 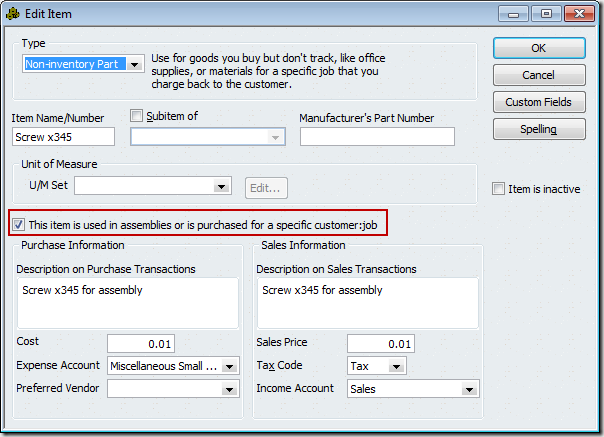 With either item, make it a “two sided” item by clicking the “used in assemblies” box. I use these items to add non-material costs to an assembly. I tend to use Service items outside processing charges, labor and the like. I’ll use Other Charge items for setup costs, sometimes. If you have some work done on an assembly by an outside processor, such as deburring or coating, add this cost to the assembly item using one of these items. When you pay the vendor for the outside processing the cost goes to your expense account. When you build the item, the cost is “capitalized”, removed from the expense account and added to the inventory asset for the assembly. This can be handled in several ways, as I discuss in my article on Outsourced or Sub-Contract Work in QuickBooks. 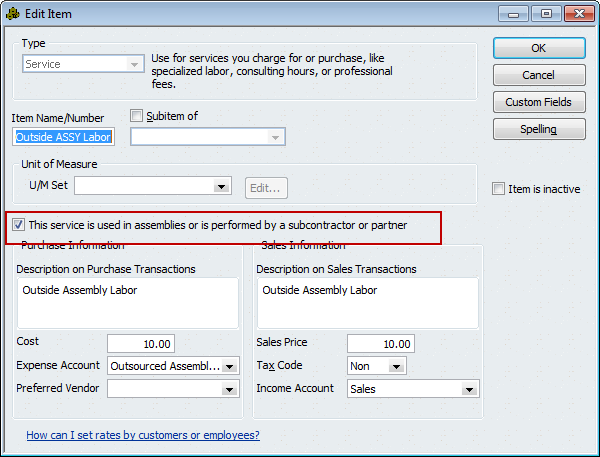 You can also use this to “burden” your assembly with your own payroll costs in the same way, using a Service item that points to your payroll expense account. Please check with your financial advisors before doing this to make sure that you are using this feature the way that they want. QuickBooks won’t allow you to use a Subtotal, Discount, Payment, Sales Tax, Sales Tax Group or Group item as a component. For the most part, this is understandable. I do run into people who would like to use the Group item as a component, similar to how you would use an Inventory Assembly. QuickBooks doesn’t support this. Note that you CAN use an Inventory Assembly item as a part of a Group. See my article on Groups for Custom Manufacturers. As I discussed above, there are good reasons to work with “sub assemblies”, splitting your complicated assembly item into more manageable sections. However, this can create more work. Consider my sample “Elite Computer System”, which had a “Computer Base System” assembly as a component. If I want to “build” the “Elite Computer System”, I must first build a “Computer Base System”. If I don’t have the base system in stock, I have to do two builds, in the proper order. QuickBooks won’t do this for me. In addition, QuickBooks won’t let me print a Bill of Materials report that shows ALL of the components in the “Elite Computer System” – it will only show me a single level. You can go to the Intuit Marketplace and find a number of add-in programs that can help. 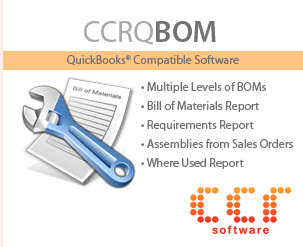 One program that you may find useful is CCRQBOM, which allows you to issue “multiple level builds” as well as print a multiple level BOM report. Please note that CCRQBOM is a product that my company produces. That is a quick run-through on item types – let me know if you have further questions, or suggestions on other ways of dealing with these item types. Charlie – we don’t mind if you ‘advertise’ your own products in your own ‘blog’….what’s the use of having a blog if you can’t pat yourself on the back and direct a little business your own way. You deserve both, for all the great news, tips, tricks and up to the minute commentary on QuickBooks and related software. Using non-inventory items in an assembly – a word of caution I think needs to be mentioned. It is true that when you use it and the non-inventory item is double sided, that the cost of the non-inventory item is removed from the expense account specified on that item screen. The problem is what cost? The cost that is used is the entry in the cost block of the non-inventory item, NOT the actual cost you paid for the items since non-inventory parts do not hold a value. The cost you enter in other words. 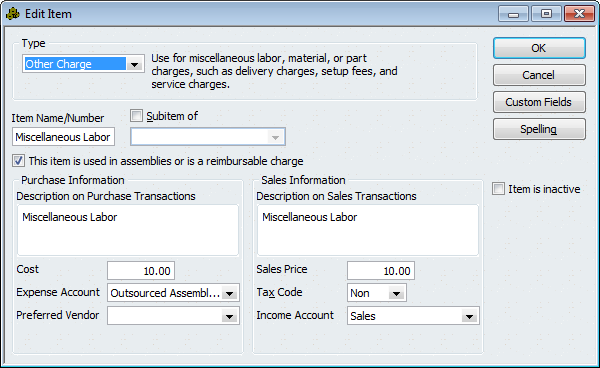 The user has to be careful not to overstate the cost per item, or the possibility exists that the expense account will go negative (a credit balance) if a higher total cost is removed (as a result of building assemblies) than was booked to the account. This same warning needs to be made concerning all other items where you specify cost. This is especially true for service and other charge items that are double sided, they have to be purchased so that the cost is booked to the expense account first, and then the user needs to post the actual per item/service cost on the item screen before using the item in an assembly. And do it all again for subsequent purchases if the new purchase price has changed – before building more assemblies. Thank you, Rustler, for pointing out that clarification. None of the costs of any components will be the “actual” cost, even with inventory parts and assemblies. Those will pull the average cost, which may be over or understating the ‘actual’ cost. However, with those items, the financial transactions balance out. When you are using service or other charge items to “burden” an assembly you are essentially entering an estimate of the cost that goes into the assembly. Using one of them for labor, for example, doesn’t put the actual labor cost of building the assembly, it puts in an estimate. This is standard practice in manufacturing, even with larger businesses. Non-inventory parts have, as you pointed out, the same issue. You are essentially entering an estimate of the cost of these parts. You should only be using these, in my opinion, for very small cost items such as washers and screws (unless you have a $300 washer in a DOD situation…). So the impact of being off on your costs should be small. We buy a LOT of screws, all different shapes and sizes. I know I need to create a separate item for each type as we buy them in boxes of 100. I think I want to track them as Non-inventory parts because it’s not practical to count them. (Besides, I have no guarantee that the assembler will use the screws specified.) Our screws are used in our assemblies and sold to our customers. I don’t think I want to include them in my QB assemblies nor track them in a sales account, but rather in some kind of overhead account. Should my Non-inventory screws post to account “Direct Supplies”? Or something else? Or is this a good plan at all? Rob, it is difficult to give SPECIFIC answers in a blog like this, without knowing a lot more about your situation. And, the choice of a specific account to use is something to discuss with your financial advisor. Typically, low cost items like screws would be treated as non-inventory parts. You don’t need to count them as you use them. You should be able to visually keep a tab on how many you have so that you can buy them when you run low. I normally recommed that the BOM include all of the parts, even low cost non-inventory parts like screws. That lets you see them in the BOM so you are reminded that they are there, it lets you get a more accurate “cost” of the assembly. But again, that is up to what your financial advisor recommends. If you are using them AND sometimes selling them, make sure that you make the non-inventory items two sided so that you can have both an expense and a sales account.